Deliver better performing websites, apps and APIs faster. Stockholm, Sweden - 26 June, 2018 - Load Impact, the leading provider of SaaS solutions for load testing of websites, apps and APIs, is excited to announce its next generation solution consisting of 3 key components: k6, Load Impact Insights and Load Impact Cloud Execution. It’s built for today’s DevOps teams and fits into software developers’ Continuous Integration workflows. Load Impact allows teams to deliver high performance software faster. "k6 is the result of collaboration between our Load Impact dev team and members of the open source community," said Robin Gustafsson, CTO at Load Impact. "We believe in the open source model for delivering innovative software solutions to the market." Your k6 load test results can easily be streamed to Load Impact Insights for storage, analysis, sharing and trending. Insights’ Automated Smart Analysis gives you a quicker understanding of the source of your performance and testing problems. Performance Alerts, like the one shown in the screenshot below (“Too many URLs”), guide you to a fast resolution. Even if you’re not a performance testing expert, you can understand the test results and take the necessary action to improve performance of your software. 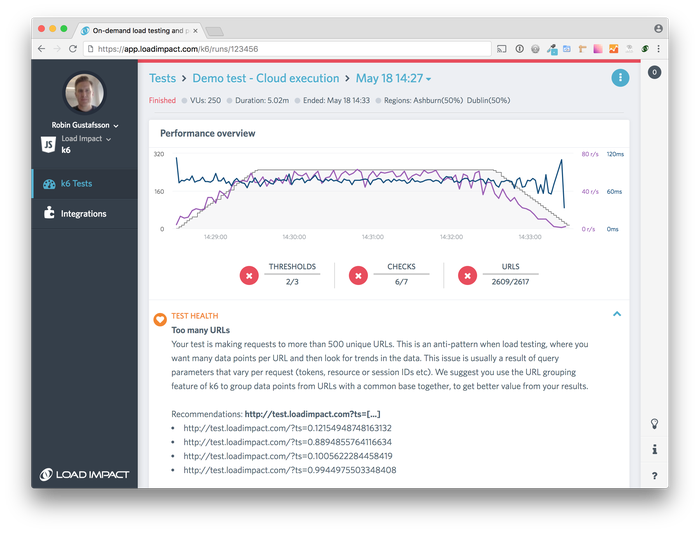 The third major component of our new load testing solution is distributed Cloud Execution of k6 tests on the loadimpact.com SaaS platform. Run much larger tests-- up to 5000 Virtual Users (VUs). Avoid the hassles of managing the cloud infrastructure needed for performance testing. Cloud Execution also lets you generate test loads from up to 10 different global locations. Dev and test teams can try out k6, Load Impact Insights and Cloud Execution for free. k6 will always be freely available (see the GitHub link below) while Insights and Cloud Execution are available through a 30-day free trial. You can also request a demo. Load Impact simplifies and automates load testing for agile software development teams. Our easy-to-use SaaS solutions are used by modern DevOps organizations from all corners of the world to test the performance of websites, apps and APIs. By integrating with leading automation and Continuous Integration tools, we make performance testing available early and throughout the development cycle. Find and fix performance issues early in the development process with Load Impact. Deliver better performing websites, apps and APIs faster.